Summer is officially here this week and we are kicking it off with a party (obviously!). Hosting parties, BBQ’s and beach bashes is always fun, but it’s even better when you have no clean up at the end! Right!?! 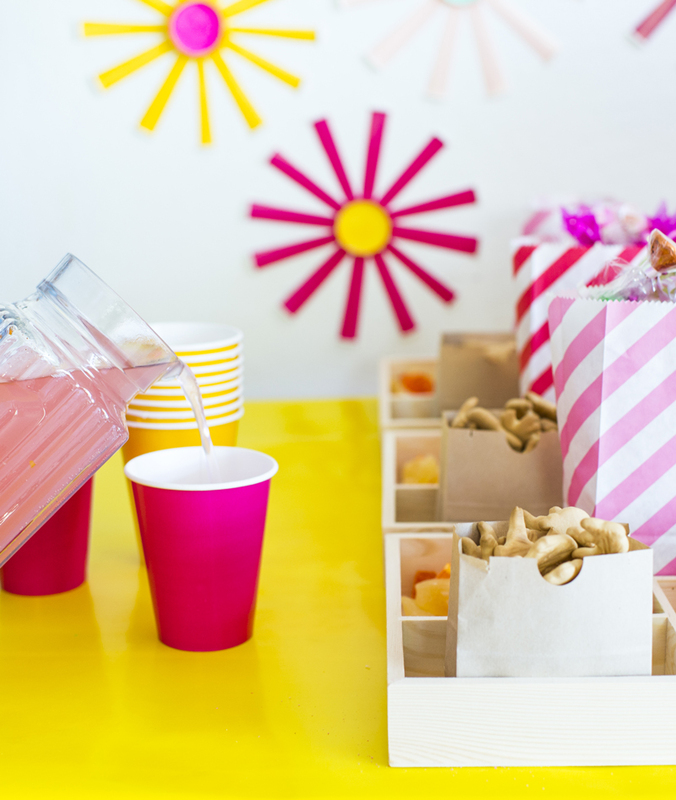 I’m thrilled to be partnering with one of our favorite stores, Paper Mart to share how a summer party can come together, from treats to decorations, all with disposable paper fun! Which means you can order with a few clicks online and afterwards you just pop the balloons, toss the paper, and go back to relaxing on that very pretty hammock out back. 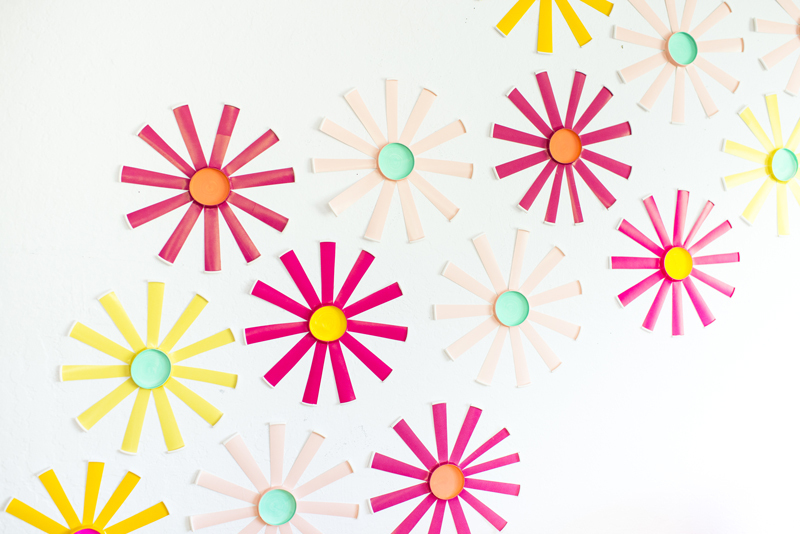 To make a party that is bright and colorful we created a wall of flowers out of paper cups! 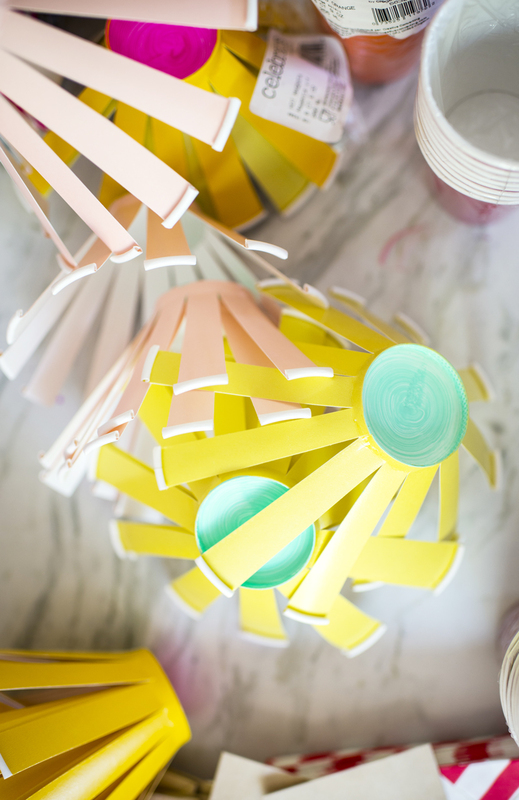 They are the easiest things to make and bring a massive design punch to any party space. They’d even work to go up more long term in a kid’s space. 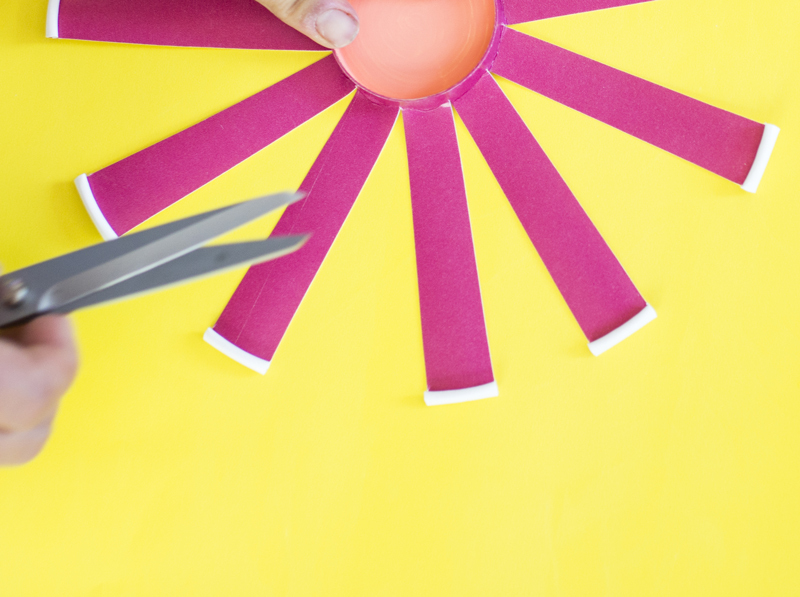 For the party purposes though, the cutting will take all of 5 minutes and the style is a funky take on a bright summer flower field. 1. 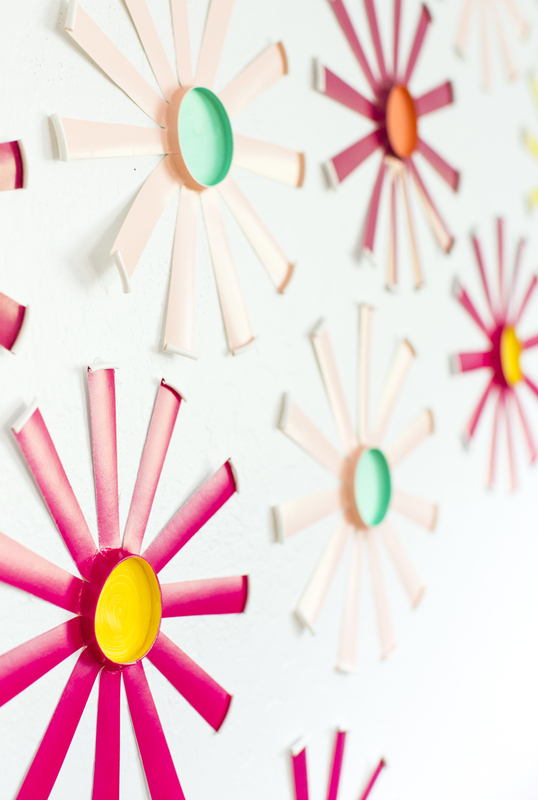 Start by cutting the paper cup into flower shape. To create our flower field look we used about 5 different shades of cups and cut in 10 sections on each cup. You’ll want to cut from outside in, stopping just before the bottom seam of the cup. 2. 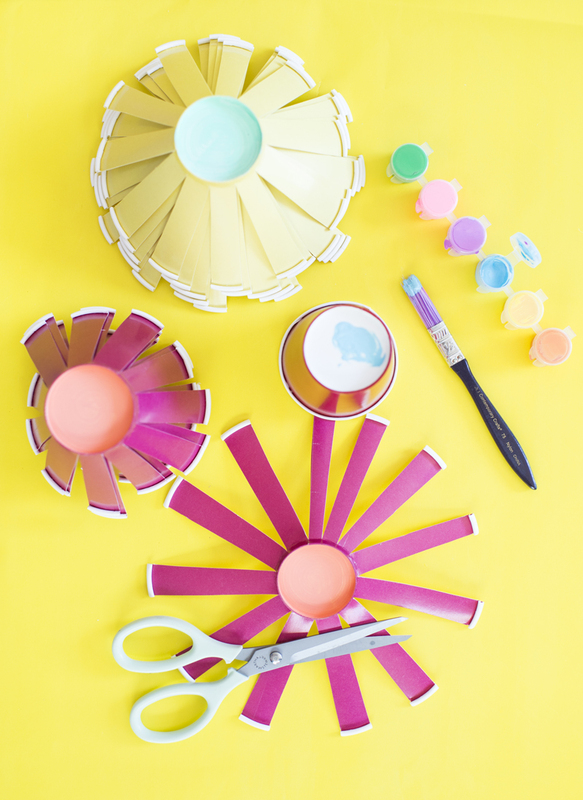 Then paint the bottom of each cup a coordinating color to create the center flower pop. This step is optional, but it really does turn the ordinary party cups into a gorgeously pretty flower display. To create an easy and disposable treat station – we decided not to do a traditional cake, which can feel heavy and messy on a hot summer day. 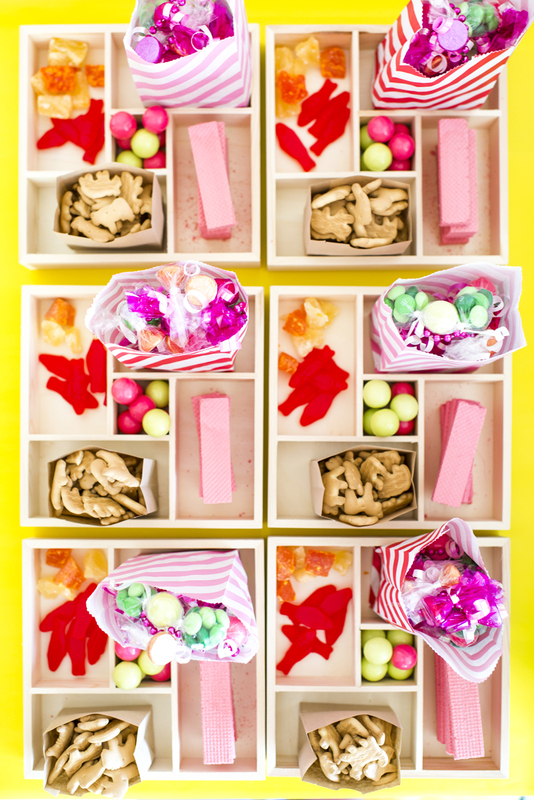 Instead we used a combination of treat bags and wooden bento boxes to create little treat trays. We used these small kraft snack sacks, and two colors of the striped favor bags. The kids love these just as much as cake and can pick and choose which treats they want to eat. 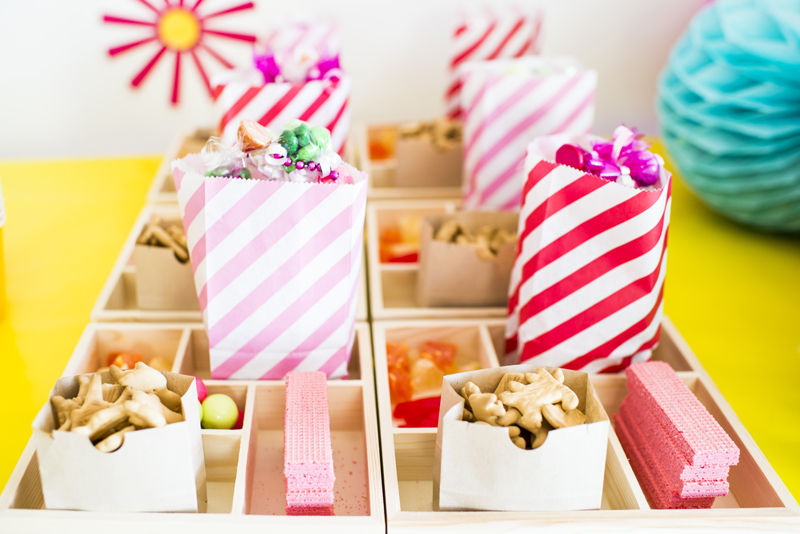 It seems like a genius way to serve a treat set up at a wedding or shower as well. 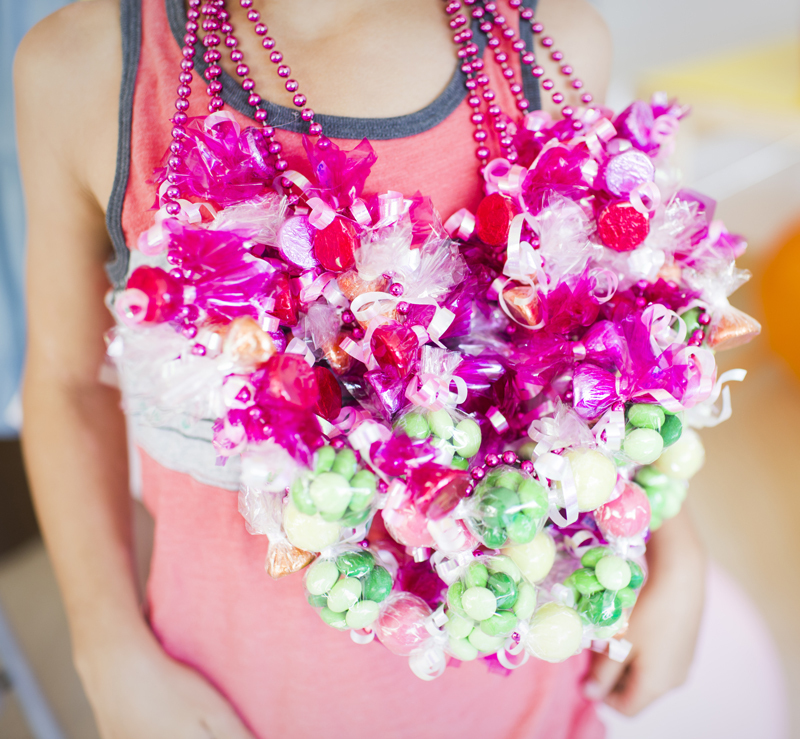 Every treat box had a candy necklace that we homemade with gumballs, m&ms and candy kisses. We used a simple bead necklace (which you can find in packs from the dollar store) and a sheet of cellophane with ribbon to create the look. 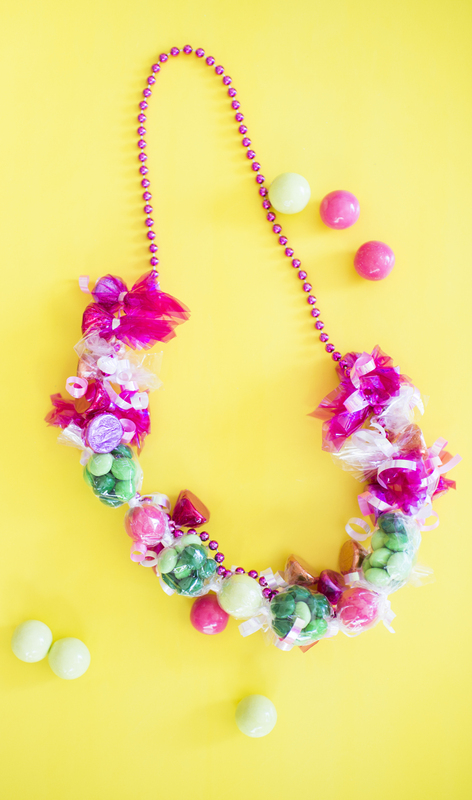 Rolling the candy up in the cellophane and then tying it onto the beads with ribbon was an easy way to create summer party favors our kids love! The rest of the party was set up with paper honeycombs which can be easily tossed or folded back up to save. 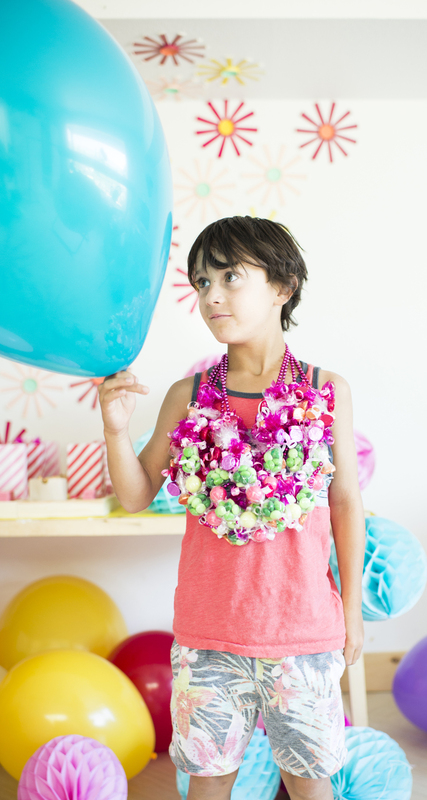 Our favorite wrapping paper tablecloth hack and lots of very large party balloons! 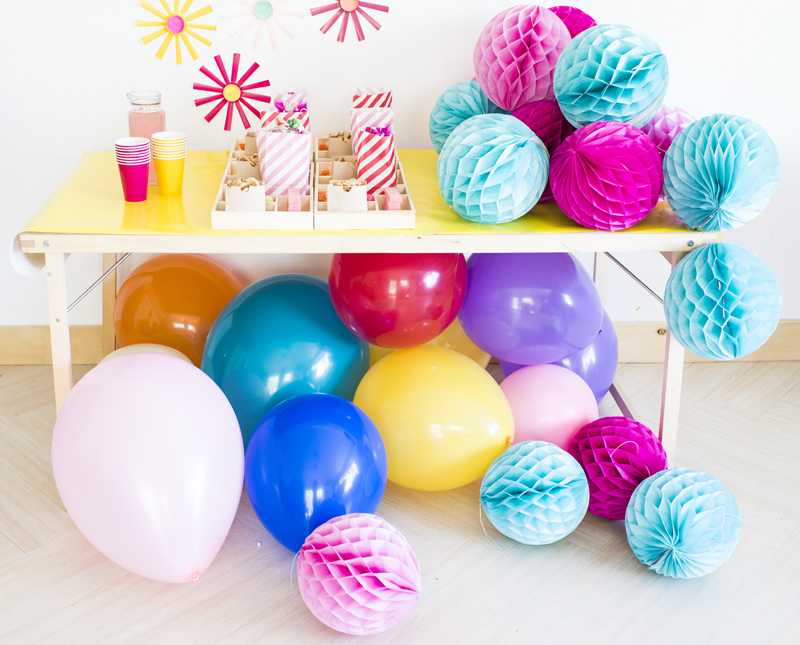 Of all the fun stuff Paper Mart sent us for this party shoot, the extra large party balloons were my favorite! They are HUGE! See the comparison to my 8 year old’s head above. Huge balloons mean less time filling the party space for me and a much more festive vibe for all our summer guests. 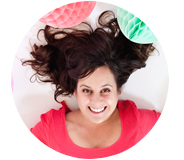 This post was created in partnership with Paper Mart a party store l adore. 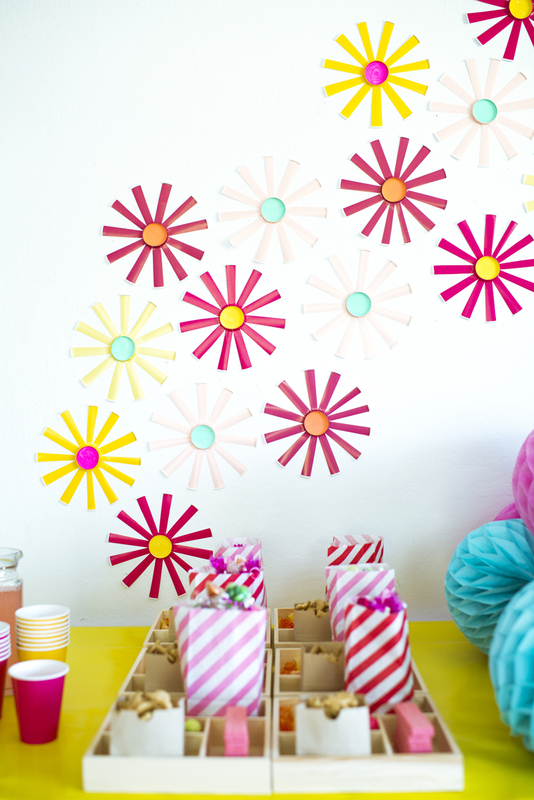 Set up your next paper party right here!